Palestinian Prisoners' Day Events and Actions - Tell us about yours! Home Events Palestinian Prisoners’ Day Events and Actions – Tell us about yours! 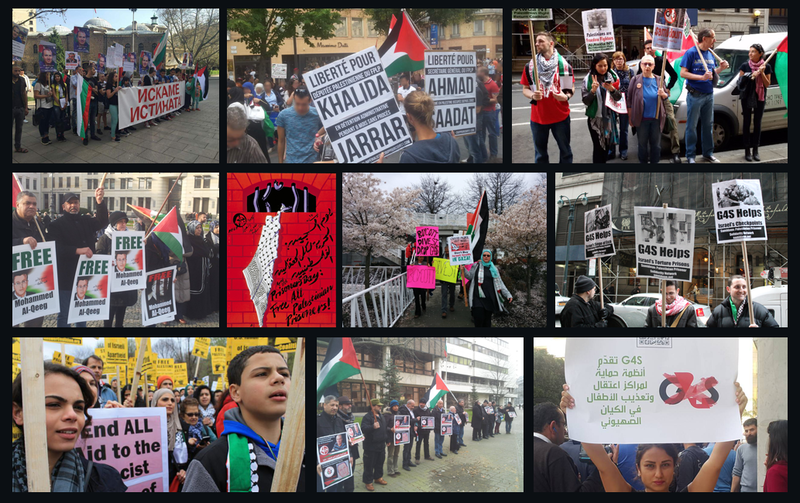 Palestinian Prisoners’ Day Events and Actions – Tell us about yours! Cities and communities across Palestine and around the world are holding events to commemorate Palestinian Prisoners’ Day in 2012. Please let us know about your own events and activities! Nearly 5,000 Palestinian political prisoners are held in jails in Israel, including 170 children and 6 women. 310 prisoners are held – without charge or trial – under administrative detention. Palestinian prisoners include over 20 lawmakers and national leaders, like Ahmad Sa’adat, Marwan Barghouthi and Aziz Dweik. On Palestinian prisoners day, Tuesday 17th of April, the Palestinian prisoners movement will launch the Karamah (Dignity) hunger strike. The magnitude of the 1600 Palestinian prisoners embarking on the Karamah hunger strike must be met with a significant international response. This means mass mobilisations to question the impunity of the Israeli state and our own governments involvement. As the resistance of the prisoners escalates, our actions in turn must escalate. This demo is called for by ‘We Are All Hana Shalabi’. More details.. In Den Haag bij een picket van 12.30 – 13.30 uur bij de Israelische ambassade (Buitenhof). Bradford United 4 Palestine will be in Student Central at the University of Bradford, in Bradford City, UK, all day, Tuesday, April 17, with information about Palestinian Prisoners’ Day and the struggle of Palestinian prisoners. The Initiative of International Solidarity for the Palestinian Prisoners will feature a talk by Shoukri Hroub of the Arab Palestinian Democratic Union (UDAP), as well as a brief overview of the intervention of the Mossad in some Latin American countries, including Argentina, Uruguay, Chile, Colombia and Guatemala. There is a protest April 17, 2012 at the Israeli Embassy in Athens, Greece at 6:30 in solidarity with the Karama Hunger Strike and the Palestinian prisoners. To mark Palestinian Prisoners’ Day 2012, on Tuesday 17th April from 1-2pm the IPSC will be holding a symbolic lunchtime demonstration outside EU House, Molesworth Street (Dublin 2) to highlight the European Union’s ongoing facilitation of Israel’s apartheid policies and war crimes – including the imprisonment of over 4,400 political prisoners. New Factsheets for Distribution on Palestinian Prisoners' Day!